On the Main Line: Boldly censoring a letter from Rabbi Jacob Joseph to Samuel Joseph Fuenn in RJJ's biography. Boldly censoring a letter from Rabbi Jacob Joseph to Samuel Joseph Fuenn in RJJ's biography. Recently I was visiting a choshuve home, and I picked up a book that looked interesting, as it indeed was. It was "The Rav Hakolel and his Generation" by Rabbi Yonah Landau, an English translation of his "ספר דער רב הכולל און זיין תקופה." This book is the fruit of his research on Rabbi Jacob Joseph, much of which had appeared in the publication Der Yid, with a series of articles beginning in 1989. Rabbi Landau seems to have single-handedly revived interest in Rabbi Joseph, New York's first and only, lamented Chief Rabbi, and out of this renewed interest has even grown a sort of cult following around Rabbi Joseph, with many pious individuals making pilgrimages to his grave on his yahrzeit and other times. It only took 100 years for him to re-enter the hearts of New York Jews. In any case, I didn't read the book, I had no time. But I did flip through it and found it to be very interesting. Normally one begins a review with the positive and then moves on to the negative, but first let me mention some negative and only then move on to the positive. The book was very, very sloppily edited, spelling mistakes, etc. This is, possibly, the fault of the translator, who probably didn't know much about the people mentioned in the book. Here are some examples of this. Naturally J. D. Eisenstein is a name which recurs in this book many times. It is not such a big deal that he is called "Eizenstein." Fine. But one time it refers to his autobiography as "Sefer Zichronos." Another time it gets it right, "Otzar Zikhronosai." My guess is that in the original Landau wrote (in Yiddish) "his seyfer zichroynos," i.e., "his autobiography," while in the other place he named the autobiography. The translator didn't realize that he meant "his autobiography" and therefore wrote "Sefer Zichronos." Why does this matter? Suppose a reader wants to investigate further and tries to find "Yehuda David Eizenstein's Sefer Zichronos." Not going to find it with that title. This is only an example, and similar things occur. Next, almost every American rabbi who routinely went by his English name is given by his Hebrew name. It's hard to say if this was intended to frumify them or not, but one reads about Rabbi Chaim Pereira Mendes and Rabbi Duber Drachman, both men who surely were called this when they were called to the Torah, but that's it. And then Rabbi Sabato Morais is arbitrarily called "'Dr.' Shabsai Morris." The final negative is that it lacks footnotes and a bibliography. Perhaps the original has them. So who was this Rav whom Rabbi Jacob Joseph addressed, the very week after he arrived in New York, as "zekan beit Vilna," "the elder of Vilna," as "His honor, my beloved friend, the rabbi and ga'on in Torah and [secular] wisdom . . . " (and to his son)? I guessed who it was, it was that easy, although I guess it could have been someone else. It was S. J. Fuenn, the leading maskil in Vilna. As it happens, Fuenn was very popular in his time and had a reputation for moderation and (even) piety. This letter was published originally in 1963 in, naturally, Yeshiva University's journal Talpiot 8:3-4 (Nissan 5563), as "Two Letters From New York's Chief Rabbi Jacob Joseph Charif (From a Bundle of Letters of R. Samuel Joseph Fuenn)". When you see the original in Talpiot you see that not only was the name blurred but a lot more was removed from this picture. The funny thing is, there was no reason to remove the first two footnotes, as you will see, which I had assumed discussed and identified the blurred out rabbi who Rabbi Jacob Joseph says is beloved, but cannot be named in the book because it ruins the message. As you can see, the entire title, everything above the Aleph was removed. You can also see that three additional words, "harofei doctor fin," that is, in Talpiot Fuenn's son, a medical doctor, is named, but in the Rav Hakolel book the name is taken out and it only says "to his son, the scholar." As you can further see, the second footnote does not explain who Fuenn was at all, it merely explain the acronym, as the first footnote did. If he hadn't removed it, by golly, it would have been less suspicious! The entire story about Fuenn is contained in an asterisk before the footnotes, so it could have kept in those first two footnotes. 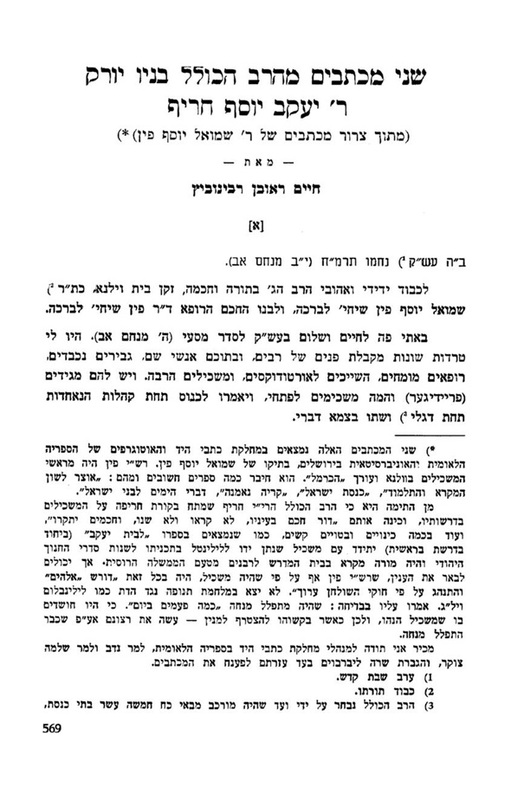 For what it's worth, Chaim Reuven Rabinowitz, who published this letter, also is puzzled at the seemingly close relationship between RJJ and Vilna's leading maskil, although he points out that Fuenn was very different from maskilim like Lilienblum and J. L. Gordon. Furthermore, it contains a hilarious oral tradition (I guess) about Fuenn. They used to say about Fuenn that he davens mincha many times a day. Why? Because someone like him could not refuse to join a minyan, saying "I already prayed." If he said that then he'd be suspected of lying and not praying at all. Thus, he had no choice but to pray a few times every afternoon. Actually, the source of this story seems to be Klausner's Volume 4 of his History of Modern Hebrew Literature, where it says "5 times a day," unless Rabbinowitz had heard it independently. The truth is, it's not so hard to explain Fuenn's relationship with RJJ. He was also on very good terms with the Netziv. It just is what it is, but it doesn't work with the polemic of the book. 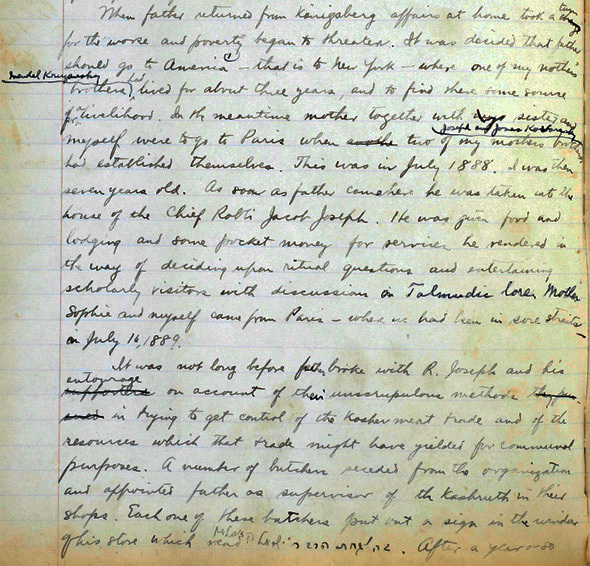 Similarly, a journal like Hamaggid is called "Reform," even though this wasn't known to the rabbis, including some of the caliber of R. Yehoshua Heschel Levine, author of Aliyos Eliyahu on the Vilna Gaon, who advertised his book in the pages of Hamggid, one of countless other examples which can be given to prove that it was not "Reform." If Hamaggid was Reform, then so was J. D. Eisenstein, a well regarded source in this book. You want to see Reform? See my post on the Malbim from the other day (link). Maybe the mistake is mine, but I read and reread and then reread those pages and it isn't there. You can read or download the entire letter as it was originally published in Talpiot right here. By the way, lest anyone think that I have something against the revival of interest in Rabbi Jacob Joseph - not at all. I think it's great and it is largely if not entirely due to Rabbi Yonah Landau. Good review. Saw the book not long ago and spent some time looking through it. I can affirm the existence of the problems you mentioned, as well as some others. 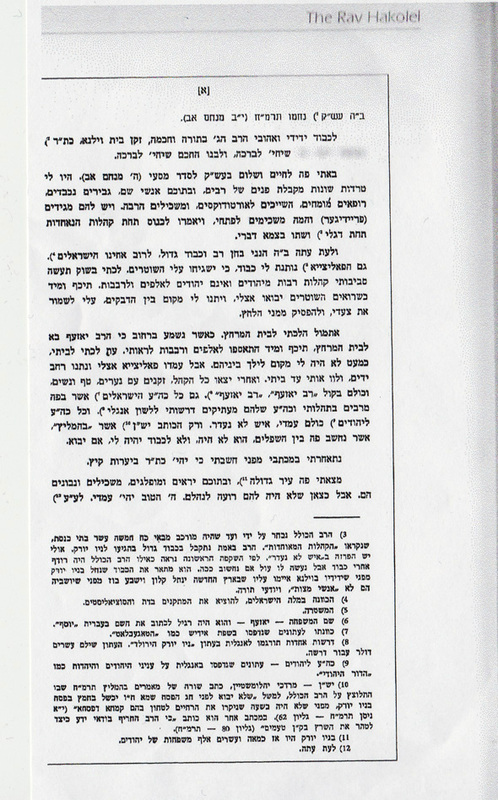 When you have a book coming out of an environment like the Satmar Newspaper Der Yid, it is not surprising, or should I say to be expected, that it will have the same type of deficiencies and biases that that publication displays, here combined with additional translation problems. I forgot to mention in the post that when I saw those flaws (spelling, etc.) all I could think was that I would have been glad to look over the manuscript and proofread it. Maybe they mean that RJJ's letter was addressed to a raven? Not sure what the big deal is. It may have been done so that an unsuspecting reader doesn't get the idea that Kuehn was some sort of talmid chochom when he actually was a kofer. Considering that you managed to string two spelling mistakes into your unwelcome regurgitation of a 5-letter name which is merely the subject of this entire page, we must extrapolate that your reading capability and general comprehension are fatally flawed at least 40% of the time. With this in mind (or whatever comical interpretation of the previous paragraph has already registered there), you should be aware that S.Y. Fuenn sat on the board of Chovevei Zion along with such noted evildoers the likes of the Netziv of Volozhin, Rav Mordechai Eliasberg and Rav Shmuel Mohilever. So be sure you add 'em (or any name with 60% similarity) to your list of censor-worthy kofrim. The Netziv might be a bit tricky though, considering the amount of sheer garbage you've already festooned your blog with on his subject. 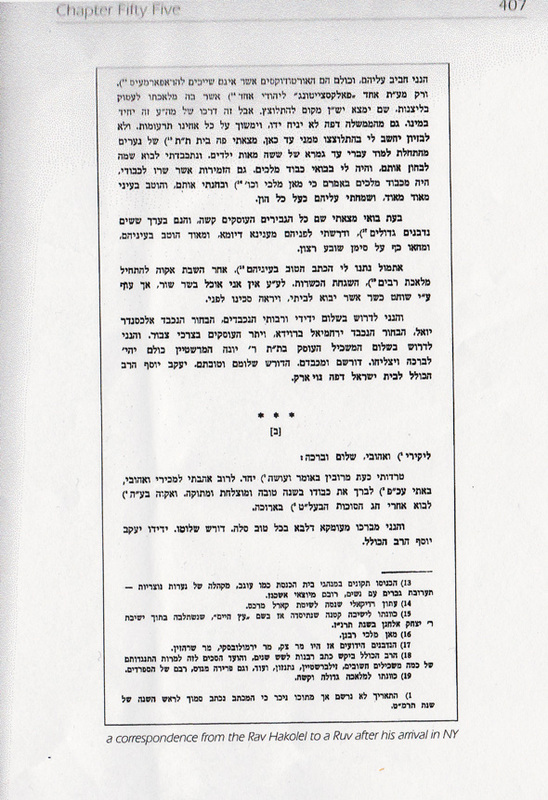 Also, hurry and destroy any copies (or photocopies or likenesses) of Seforim printed in Vilna, you know, like your Shas, your Shulchan Aruch and odds and ends like the Yerushalmi; it turns out any seforim published there were printed and usually edited by heretics like Fuenn and Plungian. You will also need to retroactively erase whatever (correct) information you've learned about the history of the city of Vilna; a lot of what you've heard might have originated in Fuenn's evil classic, קריה נאמנה. What? Where did I lose you? I can't read Yiddish, but I do remember Prof. Leiman saying years ago that no newspaper has the type of scholarly articles that Der Yid does. If I recall correctly, I don't think he meant objective research. I think he meant that Der Yid covers topics of historical or scholarly interest that you won't find in any other Jewish newspaper. Here is a link to an interesting article in Hamodia, "Kivrei Tzaddikim in America," that mentions "Rabbi Yonah Landau and his Vaad Hanessiah L'Kivrei Tzaddikim B'Artzos Habris V'Canada": http://hamodia.com/inthepaper.cfm?ArticleID=118. As for "Dr. Shabsai Morris," a.k.a. Rev. Sabato Morais, he did have semicha -- sort of. Arthur Kiron notes that his "rabbinical ordination certificate, signed by Haham Abraham Baruch Piperno, the respected chief rabbi of Livorno, attests that he completed a curriculum of biblical and Talmudic literature with commentaries and was prepared to handle Jewish legal sources... the title maskil on his ordination certificate identified its bearer as ordained to teach but was inferior to the title hakham, the highest rabbinical title used by Sephardic Jews to designate someone empowered to render legal decisions." Kiron also notes that Morais also had an honorary doctorate from the University of Pennsylvania but disliked using the titles "rabbi" or "doctor." R. Landau's failure to identify him as "rabbi" probably has less to do with Morais's own preferences than the fact that he was the founder of the now-Conservative Jewish Theological Seminary. Let me begin by saying that I have a "vested" interest in the story of Rabbi Jacob Joseph's life, given that I have written several articles about him about him in the Jewish Press. Thus I was interested in this book when I heard about it. A couple of weeks ago a friend of mine told me that he had donated a copy to a nearby shul so I took a look at it there. The first thing I do when I look at a "history" book is look for the index. There is none for this book as well as for almost all of the other "frum" history books like this. A notable exception is the bio of RSRH. I do not believe that there is a bibliography. IMO, the lack of both of these is a serious shortcoming in any history book. I was not impressed with the book. There are definitely inaccuracies in the book. Under the picture of Rabbi Avraham Rice it says that he was a talmud of the Chasam Sofer. He was not. Rabbi Rice was a talmud of Rav A. Bing. Rabbi Bing had studied under Rabbi Nosson Adler with the Chasam Sofer. There are other historical inaccuracies and some have been pointed out above. I suggest readers compare this book with Saul Stampfer's Lithuanian Yeshivas of the Nineteenth Century. This book is copiously footnoted and most thoroughly researched. Landau's book does not measure up to it at all. Harediandproud: Sometimes you really are a parody of yourself. This is a blog devoted to books and bibliography. You really don't belong here. Did you really believe that the type of people who read this blog will take your silly comment seriously? Rabbi Landau visited my Shul and I glanced at a copy of his English book. I noticed a curious story to the effect that in mid 19th century New York Jews demonstrated against a Jewish merchant who kept his business open on Shabbos and forced him to close it. I found this a little difficult to believe. Does anyone know any source for this story? I had the opportunity to meet Rabbi Landau in his home on Lee Avenue and talk local history a few year ago, when I was writing my senior thesis in Stern college. It was so kind of him to meet with me. He is a remarkable researcher and very good at what he does, by Satmar standards and even by general standards. The fact that he would blur out the names of maskilim like Fuenn and leave a misleading bibliographic trail is not surprising. He probably realizes that a let-the-sources-talk, kabel-et-ha'emet-mi'mi-she'omro-style history will not win him any friends within his community. It's pretty cool that he can do what he does as it is and he seems very highly regarded in his Satmar milieu, where he is accepted as a rare exceptional person who does real historical research. You're right. This is embarrasing for me, because there is a little note Kaplan added on top of the page that I did not "read and reread and reread" - I skimmed it once - and it is in that note. I'll correct the post! I'm impressed with him too, but isn't that "He's great . . . for Satmar" a little condescending, or at least depressing? There's no reason why someone who knows that Illoway is not Illavy and who can spell can't be hired to look over the book and just tighten it up. As for fuzzing out a name and then calling it a "Ruv." Just don't do that. Don't print that letter, or be a little smarter about how you Photoshop it. Lawrence Kaplan, thanks for your kind words, but I would rather anyone who wants to comment here to do so. As for the content of what H and P wrote, let's just say that it is much less penetrating and convincing than his own posts on his own blog. 1) On thinking about my comment about Prof. Leiman, he might have been referring to Der Blatt or one of the other Yiddish papers. I'm not 100% sure. 2) S.: We nitpick about these things, but overall, don't you think it wiser to print these type of things with slight censorship than not print them at all? At the end of the day, how super important is it that RJJ wrote a letter to Fuenn? In the academic world, it's unacceptable, I understand that. But if one is writing for the charedi masses, is this slight censorship so terrible? Yes, better not to print it. It is still in Talpiot. You can probably find this volume without tons of difficulty. From a purely pragmatic perspective, this type of distortion turns off many. I don't know if turns off as many as it "protects," but I think that if in order to construct RJJ as a tzadik and chosid one has to change him, better to leave him alone in his grave than to drag his bones out and dress him up. It makes the Chareidi hashkafah look false. If current Orthodoxy has no way to digest the fact that Fuenn was friends with loads of rabbonim, whatever that means, then there is a problem. 120 years ago when this was all actually happening and was public knowledge, don't you think that frumkeit could handle it? The problem is that the legend is that the maskilim were worse than the Nazis, and there is no room for an SJ Fuenn who obviously was not worse than a Nazi. I think that you can't have it both ways. If you want to show that RJJ was received well in NY, and he sent out a breathless letter to a friend, don't pretend it's a "Ruv" whose name you have to scratch out. What I am saying is: If 99% of Person A's life will serve as an inspiration for other people, but 1% is not politically correct, how important or essential is it that the 1% be revealed? It's fun "catching" charedim covering up the truth, but really, at the end of the day, how important is some of this censorship? In my opinion, a lot of it is rather trivial. I disagree on two counts. First of all, the 1% may not be so unimportant; it may be the 1% that is different and challenging which prevents a society from degenerating into a Sodom of forced conformity. Secondly, I do distinguish between not showing 1% which is unessential and showing something but then twisting it, as was done here. Why did Landau have to print a picture of this letter? If he or the public (99% of whom will have no clue who Finn is anyway) can't handle this complex 1%, I have a good eitzah. Don't print it. There were many documents relating to RJJ which were not printed in the book. Finally, everyone comes from the masses. No one is born an intellectual. Like I said, plenty of people become disgusted by this. And this stuff eventually gets out. This stuff does not necessarily get out, except maybe on a forum like this which 99% of the people don't read. Look, I'm not for censorship, but I can see someone thinking something along the following lines concerning a sefer that was recently republished without Rav Kook's haskamah (the one Marc Shapiro makes a big deal about): "The deceased author undoubtedly wants the greatest number of people to read his ideas. I do too. If I print Rav Kook's haskamah, far fewer people will read the author's ideas and far fewer will respect them. Therefore, although all this is silly, I will be doing the author a disservice by reprinting Rav Kook's haskamah." The foregoing is especially good reasoning if the author in question had virtually nothing to do with Zionism. I agree, though, that writing that RJJ wrote to a "rav" is a plain lie and therefore wrong. He should have just said "an aquaintance." I thought it was at least honest of him that the blurring of someone's name is obvious. This morning, the author came to the shul I was davening selling his book. I decided to purchase a copy and ask about his interest. R' Landau said he's interested in all things history. I borrowed a smart phone from a friend, pulled up your blog, and lets just say I did not have the heart to ask this gentleman if he was at the Asifa! He was hooked, and genuinely please that his book was getting publicity. He indeed does not speak "a good English" (his words). He explained to me he was very focused on selling the book, and does it to support himself. He also feels that most people do not learn history at all, and he said to me he finds it overwhelmingly disappointed that people do no "look beyond their circle" to understand Gedolim from past generations and what they went through. I also asked if he is a fan of R' Hillel HaKohen Klein (Hey Dan!) and he really is. He was proud to have a picture of him in the book. This was apparently a single handed effort, and you may know, editing your own work in a language you don't speak is tough! On a non related topic, yes, I am celebrating the last weeks of school by watching the "Camp Krusty" episode until my staff looses it. Doh! Lakewood Falling Down: It's not just tough editing a book in language you don't know, it's ridiculous. Again, why couldn't R. Landau have gotten some friend who speaks English to edit the book for him? I see Lucid tore harediandproud to shreds. I loved it! LFD, wow, thanks! I'm glad he took it in good spirits, since I really liked a lot of what I saw and wanted that to come through too. Speaking of English and so forth, I've seen similar things with Israelis working with English. An Israeli gets and Israeli who seemingly knows English very, very well, to translate something for them. But it remains full of mistakes, or awkward language. because they really needed a native speaker to at least look over the finished work. In the RJJ book I'm sure the translator knows English well, but the bigger problem was probably not knowing the characters and topic of the book itself. As dismayed as I am at the crude mode of censoring displayed in R. Landau's book, on balance I have to admire the man. Laboring as he does under what we might regard as severe educational and cultural handicaps, his shortcomings as a historian in a "professional" sense seem to be outbalanced by his intellectual curiosity, courage, and sheer love and devotion to the historic figures that he writes about and seeks to memorialize. Look at it this way (lehavdil): how would we judge an average, nonacademic Arab citizen who took it upon himself to write a 99% objective history of the Israeli-Arab conflict, while choosing to blank out 1% of his material that he found too hot to handle? I think that on the whole, we would be pleasantly surprised. And besides, any "fan" of my great-grandfather is a mensch in my book! Does anyone have a clue have to contact Rabbi Landau? S., if you do, can you email me? Not that kind of Rov. An objection to Malbim's appointment in New York. Ami Magazine draws on an old tradition? A "melancholy anecdote" from Russia, 1846. For the Dictionary that has everything.